Just like perpetual fog, twisting hills and creative thinking, coffee has long been an integral part of the san francisco experience. This has been true since the mid-19th century when the city was first introduced to the exotic bean via companies such as folgers coffee company and hills brothers, who set up shop there to sell readymade caffeine fix to weary gold miners. The city’s infatuation with coffee was born. Ever since, it has been the beverage of choice for countless generations of san franciscans, from the beat poets and counter-cultural figures of the 1950s and ’60s to the futuristic tech entrepreneurs of the present. Along the way, it’s been the city’s spirit of innovation that’s helped to define its role in the broader narrative of coffee, and today san francisco’s coffee scene is more vibrant than ever, thanks to a new established order of local roasters who are exploring, challenging and changing the very definition of what it means to enjoy a really good cup of coffee. “what defines san francisco’s coffee scene? Innovation,” says eileen hassi rinaldi, the owner and co-founder of ritual coffee roasters. 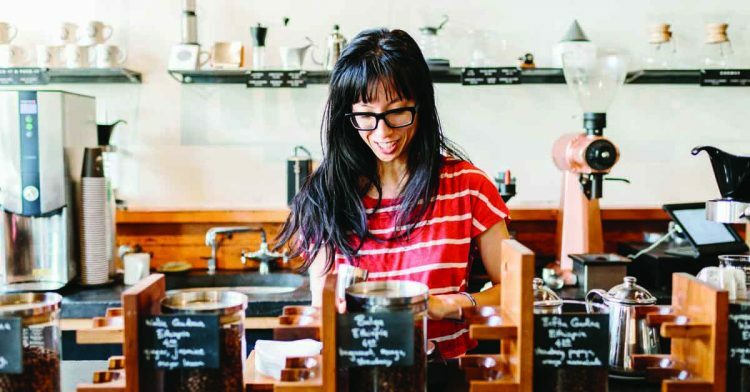 She opened her first shop, on 1026 valencia street, in 2005 and brought with her an attitude towards coffee that she developed while working as a barista in seattle. That attitude was in line with what is commonly referred to as the “third wave” of coffee consumption, a contemporary way of looking at coffee that follows a hypothetical narrative charting a course through the beverage’s popularity in america. The first wave equates to appreciation of coffee as a quick caffeine delivery device – imagine the bitter swill of roadside american diners or the bland brew created with mysteriously everlasting synthetic crystals of instant coffee. The second wave loosely coincides with a shift in perspective towards coffee as a gourmet – yet still proletarian – drink. A vast stretch of time that begins somewhere in the mid-20th century, it includes such developments as the introduction of italian espresso, the rise of dark roast speciality coffee, a broader awareness of ethical coffee sourcing practices such as fair trade, and the mass popularisation of speciality coffee via global chains like starbucks. And in fact, although purists might balk, it was starbucks in particular that set the groundwork for the current generation of roasters by introducing casual drinkers to the idea of ordering and paying a premium for speciality coffee. So what is the second wave? Imagine the rich chocolate and burnt graham cracker taste of a cup of french roast or the forgivingly soft milkiness of a latte. The third wave builds off the second, but re-imagines coffee as a complex craft beverage with a full spectrum of sometimes delicate and sometimes bold flavours dependent on a variety of factors such as growing region, freshness, type of roast, brewing method and brewing time. Roasters of this generation develop relationships with farmers around the world to directly source unroasted beans to showcase specific varietals from specific lots. There’s a sense of terroir to third wave coffee, which is brought out in the roasting process by applying a lighter touch that often leaves the finished beans a muted matte brown as opposed to an oily black. The flavour profile created by this process can be quite surprising to new initiates. Order an espresso at ritual and you might find yourself with a mouthful of unlikely flavours; its espressos reveal a remarkable amount of fruity acidity with offbeat notes such as sweet lime, ripe plum and almond praline, all of which might be otherwise blunted by a longer roasting time. One of the ways in which rinaldi and other bay area coffee shops do things differently is by focusing on the craft of brewing coffee itself and the different ways in which it can be prepared. And one of the most iconic san franciscan preparations is also one of the plainest: old-fashioned drip coffee, served black. But you won’t find any automatic coffee machine, percolator or other bulk-batch contraption hidden away behind these counters, and while you might find a stray french press, it’d hardly be the most exotic gadget on display. Over the past 10 years, san francisco has embraced a whole range of previously unusual brewing methods that allow the barista to make single-serving cups of drip (or “pour over” as it’s commonly known) coffee with a degree of control that rivals the near-algebraic variable complexity of espresso. So now a new potential for what brewed coffee could be was revealed, and it could be every bit as controlled and carefully made as a masterfully pulled shot of espresso. In the clover’s wake, san francisco roasters began looking to other novel forms of brewing that, though less high-tech, employed a similar variable-controlled mentality. This included everything from the classic – like the chemex, a design piece from the 1940s recognised by the museum of modern art that looks like a broken hourglass and creates a delicate, tea-like coffee – to the unusual – the aeropress, a sort of french-press-in-reverse made by aerobie, a company more popularly known for its frisbees – to the foreign – the hario v.60 from japan, a single serving glass pour-over filter system that, though it requires a deft touch, produces a cup that’s clean, transparent and completely free of sediment. Some of the most unique and innovative brewing methods can be found at james freeman’s blue bottle coffee roasters’ locations. Freeman started brewing coffee in 2002 at a farmers’ market stand across the san francisco bay bridge in oakland, and has since expanded his business to include multiple shops in the bay area and beyond. In 2012, and again in 2014, he received rounds of venture capital funding that in total amounted to us$40 million. This has helped him expand outside of san francisco to locales including new york, los angeles and even tokyo. Between the us and japan, there are now a total of 38 stores. Fittingly, the blue bottle location at 66 mint plaza looks more like a minimalist 1960s science laboratory than a conventional coffee shop, with high ceilings, white walls and very little else in the way of decoration. Instead, the focus is on the coffee preparation itself, which features baristas tending to a few other notable contraptions imported from japan. The first is a us$20,000 lucky cremas bonmac 105 siphon bar that uses precisely controlled halogen lamps to heat and create a vacuum within glass baubles that results in a complicated cup of coffee whose flavours – which, depending on the beans used, can be anything from citrus fruit to graham cracker – unfold as the beverage cools. “it’s expensive and impractical, but i like expensive and impractical,” says freeman. Similarly impractical, though perhaps less expensive, is a japanese cold-brew iced coffee dripper that takes up to 12 hours to make a batch of blue bottle’s signature kyoto iced coffee. It runs water, drip by drip, through a network of five glass globes and a filter to create an earthy and almost smoky concoction with a dense body and a tough caffeinated kick. And with that mentality, who knows? You might begin to see cues from san francisco’s third wave of coffee at a cafe near you.